How Much Can I Make with a Green Turtle Sports Bar & Grille Franchise? 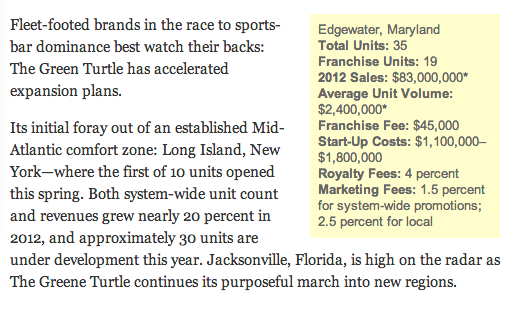 Connie Gentry of FSR has written a short blurb on the popular Maryland franchise The Green Turtle Sports Bar & Grille. It is not clear whether this is an advertorial, a press release, or simply a small news piece. It matters because if this was an advertorial, it would have to comply with the FTC's Rules on Testimonials and Endorsements. It is further unclear as to what the * is supposed to refer to - I expect the author thought that this was sufficient notice that some disclaimer was being made about these numbers. But no such disclaimer was in the article. Since, it was not clear what reliance one could reasonably place on these AUV's, I decided to get the Green Turtle's 2012 FDD and look at the Item 19, directly. This is the middle of 2013, and the 2012 Item 19 was calculated for the end of 2011, we do need to get some up to date data if we were going to make a buying decision. But, instead I want to highlight something I have seen a number of times. First, this is a gross sales only Item 19. 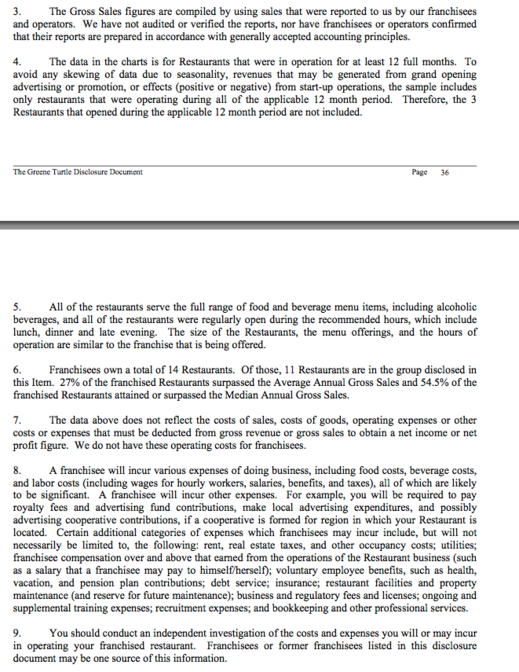 There is not enough data here to make a reliable cash on cash return estimate - important basic costs line rent, cost of goods solds, and labor are not disclosed. 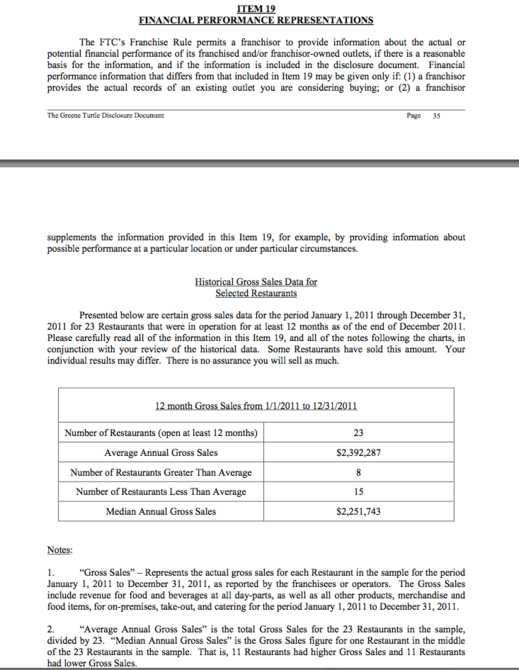 Second, and I have seen this a number of times, is the insertion of a median annual gross sales. In this case, 11 locations had gross sales above the median and 11 had gross sales below the median. The natural question is: what was the average gross sales for the 11 locations under the median? Could be $500k, $1million, or even up to $2.24million. Makes a big difference. But, we don't get any more useful data - just some disclaimers. So, what you should you do? After all, it is important to know what the gross sales of those units below the median. It is a flip of the coin whether your location will be above or below the median. The answer is to ask: ask for the back-up, look at those 11 units and calculate yourself their average gross sales. Because if you don't ask, nobody is going to tell you.